The Game Of Thrones season 5 Blu Ray stars Peter Dinklage as the Imp Tyrion Lannister, Lena Headey as his sister and Queen regent and Kit Harington as 'you know nothing' Jon Snow. The Game Of Thrones season 5 Blu Ray picks up where season 4 ended with so many questions unanswered. See why the world sees Game Of Thrones series 5 Blu Ray is the best show of all time. 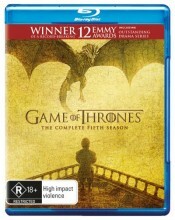 Click the button below to add the GAME OF THRONES - COMPLETE SEASON 5 (BLU RAY) to your wish list.